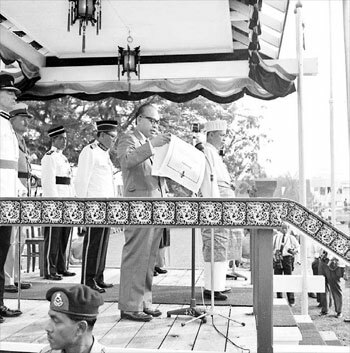 WE are just nine days away from Malaysia Day the day when 50 years ago, Sarawak gave up its brief spell as a sovereign nation to join Sabah, Singapore and Malaya to form Malaysia. For those of you who aren’t sure if Sarawak was ever an independent nation besides the 100 years when it was under the rule of the White Rajahs, a little lesson in history should clear this doubt. About 100 years after the birth of the state Sarawak in 1842, for about three years during the Second World War, Sarawak lost its sovereignty to the Japanese occupation forces and was effectively a Japanese territory. After the war, the third Rajah Sir Vyner Brooke ceded Sarawak to British Colonial rule and our state became a British colony until Britain granted independence to our state on July 22, 1963. So Sarawak was an independent sovereign nation from July 22 1963 to 16 September that same year when it became part of a new nation Malaysia. Now with the 50th anniversary of the birth of our nation just round the corner, everyone is taking a look back to see what can be found in that half century of independence as part of Malaysia. There is a big debate among Sarawakians on what we have achieved in that half century. I have no intention of wading into this discourse which sometimes threatens to boil over. For some, it has been five decades of discontent while others are grateful for what we now have. Rather I want to bring up something we must never lose sight of as we move to the future – our past. Plans are afoot by the state government to expand the Sarawak Museum into a heritage square that will include several museums, covering a large area in the heart of Kuching. This is, indeed, a commendable and noble idea and all Sarawakians should give this project the thumbs up. However, it is inevitable that most of our history will be lost as we move on, hence preserving our past is a race against time. Unfortunately, instead of preserving our history, we are erasing important vestiges of our past when we change the names of roads named after prominent people in our history or those of important landmarks of the past. I am not against naming roads or bridges after present leaders but surely, we could name new roads after them instead replacing names of old road with theirs. For example, Jalan Tunku Abdul Rahman, the road that runs in front of the Hilton in Kuching, is formerly known as Thomson Road in honour of a prominent British Colonial officer. While Tunku Abdul Rahman deserves to have roads and buildings named after him, I wish we could have done so without erasing part of state’s history. A few years ago, The Borneo Post ran a series of articles themed What’s in a name? on the origins of names of roads in the state and it was an eye opener for many readers. We have taken the names of roads for granted and almost never thought of the people behind the names. How many Kuching residents, for example, know who Badruddin, Crookshank, Deshon, Ellis, Bamfylde and Ong Tiang Swee were? Yet, many of us drive along roads named after them almost everyday. Here is a little recap on one of the road names we wrote about – Jalan Badruddin in Kuching. Badruddin was a Brunei noble who was posted to Sarawak when Sir James Brooke first came to what was then the administrative centre of the Brunei Sultanate. He later became a close and loyal friend of the first White Rajah which made the Sultan uncomfortable. As his close relationship with Brooke aroused suspicions of the Sultan, he was recalled to Brunei. That reposting turned out to be his death sentence because the Sultan, fearing he might form an alliance with Brooke, decided to kill him. Rather than facing execution, Badruddin decided to take his own life by blowing up his own house with gunpowder together with his family. Before he died, he gave his slave boy a ring given to him by James Brooke as token of their friendship with instruction to tell his friend (Brooke) of his demise. Badruddin Road today bears testimony to this touching chapter in our state’s history. It would be very sad if one day the name of that road was replaced and the memory of a loyal prince removed from our history.